Further nurse strikes in the Republic of Ireland have been suspended after its nursing union received recommendations from the country’s highest industrial relations authority. Ireland’s Labour Court has issued proposals to the Irish Nurses and Midwives Organisation (INMO) in an attempt to resolve the ongoing dispute between the union and the country’s government. The dispute centres around the IMNO’s claims that low wages have impeded safe staffing by affecting recruitment and retention levels. Although the court’s recommendations are not legally binding, all parties are expected to consider them. Ongoing funding to maintain safe staffing levels. Changes to salary scale and allowances. Increased education and training opportunities for nurses. An expert group to urgently examine remaining pay and reform issues raised by the union. INMO general secretary Phil Ní Sheaghdha said members will soon be presented with details on the recommendations, which will then be subject to a ballot. Ms Ní Sheaghdha thanked all those who had taken part in the industrial action, which saw its members provide only life-saving care and emergency response teams for 24 hours on 30 January, 5 and 7 February. A further 72-hour strike was due to go ahead this month before the court ruling. ‘We are immensely grateful for our determined nurse and midwife members, who are standing up for our patients and our professions,’ Ms Ní Sheaghdha said. Health minister Simon Harris welcomed the Labour Court’s recommendations and acknowledged the past few weeks had been difficult for nurses and patients. 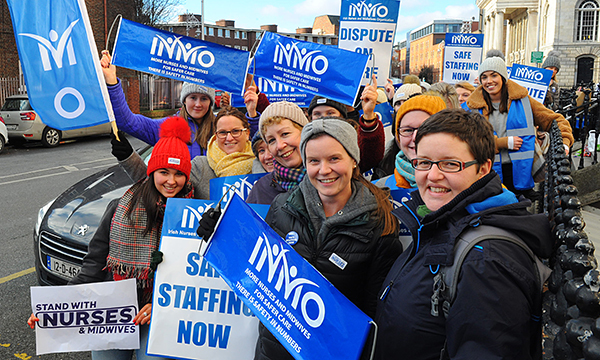 The industrial action is the first of its kind taken by the INMO in 20 years and RCN Northern Ireland has expressed support for the INMO’s action. Ireland’s Labour Court is a ’court of last resort’ meaning all other avenues of dispute must be resolved before it considers matter.